Who loves cheesecake? Raise your hand! I have a soft spot for the stuff. In the early days, both before the Husband and I started dating and for about a year afterwards, one of our favourite things to do was go out for a slice of cheesecake. It would either be a slice of mango cheesecake or New York cheesecake drenched in strawberry sauce. Our waistlines and wallets couldn’t sustain the habit so it’s been a long time since we’ve made a trip out solely for the pleasure of sharing a slice of cheesecake. Besides, now, I can bake my own and we’ll have an entire cake all to ourselves! I’m joining over 60 incredible bloggers today to bring you an incredible list of cheesecake inspired recipes, simply because we love it so much (full list of links at bottom of this post). Preheat oven to 350F. Line 2 nine inch cake pans with parchment paper and butter the parchment paper and sides of the pan. In a large bowl, sift together the all purpose flour, cake flour and cocoa powder. Whisk in both sugars, baking soda, baking powder and salt. In another large bowl, whisk together the vegetable oil, eggs, vanilla extract, sour cream and coffee. Add the liquid ingredients to the dry ingredients and stir until well combined and no streaks of flour remain. Stir in the grated chocolate. Divide the batter evenly between the two prepared pans. 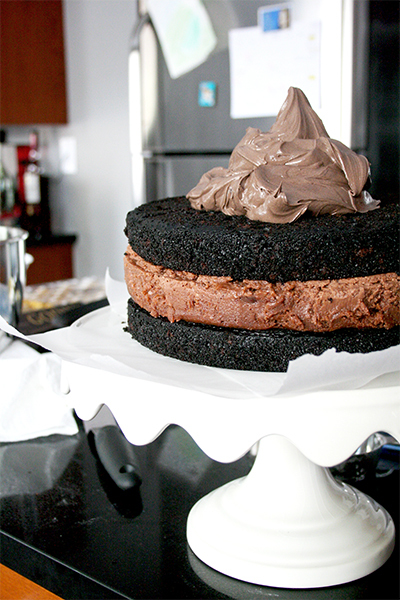 Bake for 25 to 30 minutes or until a cake tester inserted into the middle of the cake comes out clean. Allow to cool in the pan for at least half an hour before removing. 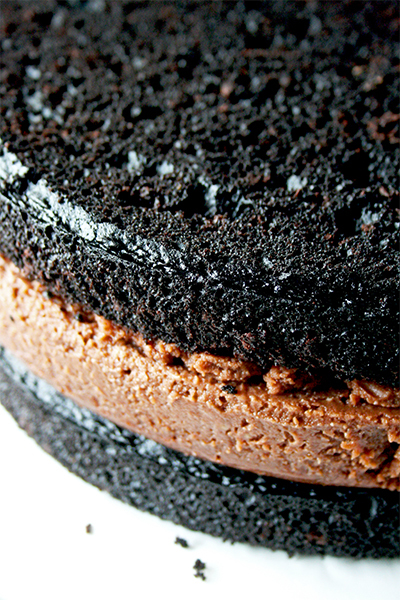 Flip it out any earlier and the cake may be too tender, resulting in a cracked cake. Preheat oven to 350 degrees F. Line a nine inch cheesecake pan with parchment paper. I used the water bath method to help prevent cracks – if you do as well, wrap the outside of the cheesecake pan tightly with at least two layers of tin foil. In the bowl of your stand mixer or a large bowl with an electric hand mixer, beat the cream cheese until fluffy. Add the sugar and mix until well combined. Add the eggs and vanilla and mix until combined. Add the Nutella and mix until combined. Pour the mixture into the cheesecake pan. Open the oven and place a jelly roll pan or any baking pan with sides onto the middle rack. Place your cheesecake tin into the centre and pour water into the baking pan until it almost reaches the rim of the baking pan. Bake for approximately 1 hour and 15 minutes or until the centre of the cheesecake is set but slightly jiggles to the touch. Turn off the oven, leave the oven door open a crack and let the cheesecake sit in the oven for an hour. This will ensure that the cheesecake is fully set but will also assist in preventing cracks due to the slower cooling. Remove the cheesecake from the oven. Run a knife around the edge of the pan to separate the cheesecake from the cheesecake tin (another tip to prevent cracks). Allow to cool completely before placing into the fridge. I chilled my cheesecake in the fridge overnight so that it would be easier to handle for cake assembly. Place the butter into the bowl of your stand mixer or in a large bowl with an electric hand mixer. Beat the butter until light and fluffy. Gradually add the icing sugar and mix until fully combined. 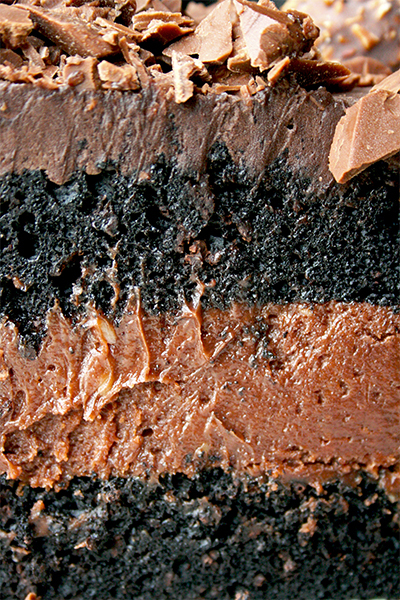 Add the Nutella and cocoa powder. Mix until fully combined. Taste as you go along. If you prefer your buttercream sweeter and stiffer, add more icing sugar as desired. If the buttercream is too soft to spread, place it in the fridge for about 20 minutes to stiffen. I’m lazy so I didn’t crumb coat my cake. Feel free to do so for a lovelier finish. Cut pieces of parchment paper and arrange them in a ring on your plate. 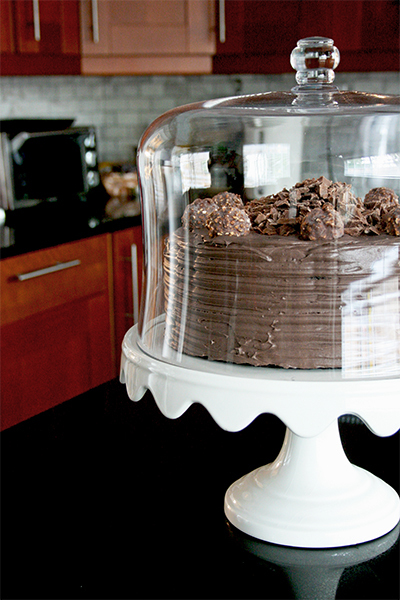 Place one layer of chocolate cake on top of the parchment paper. This will make clean-up a breeze after you’ve finished assembling your cake. If the top of your cake is domed (as mine was) you can slice it off with a bread knife. 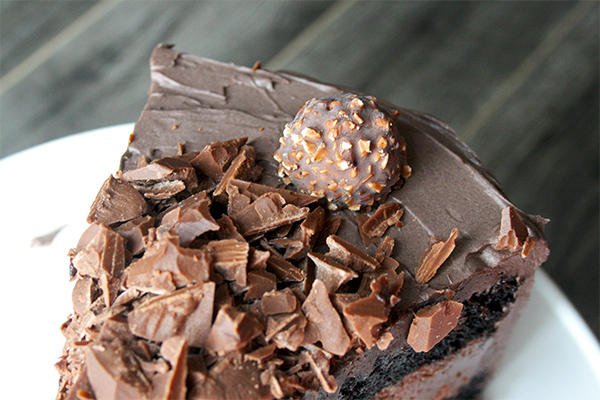 Place the Nutella cheesecake on top. Add the second layer of chocolate cake on top of the cheesecake (again, you can remove the domed top of the cake with a bread knife). Frost the cake. Remove the pieces of parchment paper and be amazed at how spotless your plate is! 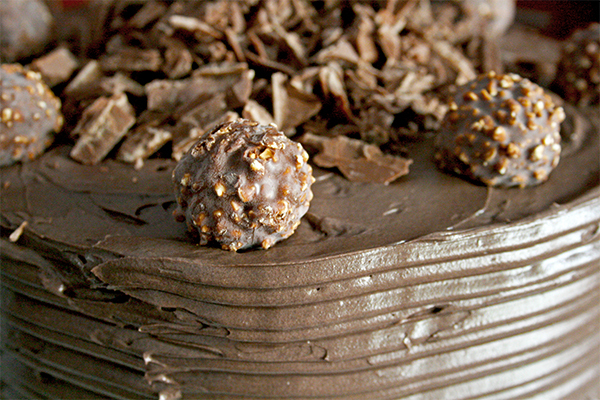 I topped the cake with Ferrero Rocher and chopped milk chocolate, simply because I decided it wasn’t decadent enough. 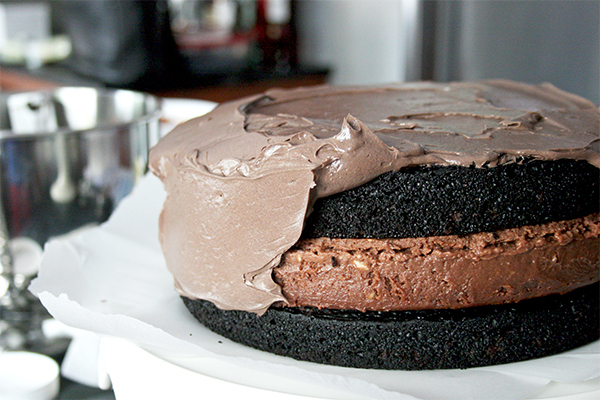 Sigh…this is one of the best cakes I’ve made in a while. 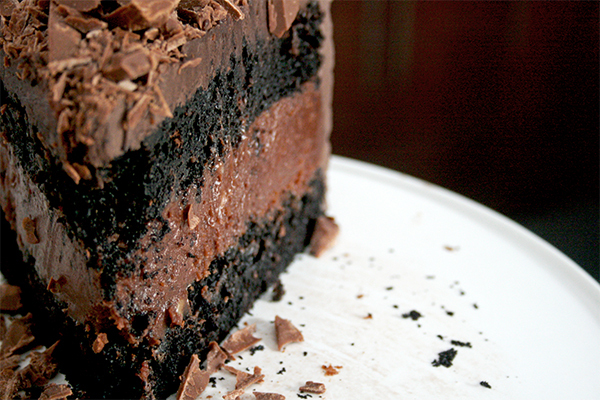 The chocolate cake was perfectly moist, tender and so rich and chocolatey. The cheesecake layer had a fabulously pronounced chocolate hazelnut flavour and was super creamy, as opposed to dense and crumbly as some cheesecakes can be. Make sure you visit everyone else’s blog today for some amazing and tantalizing cheesecake inspiration!